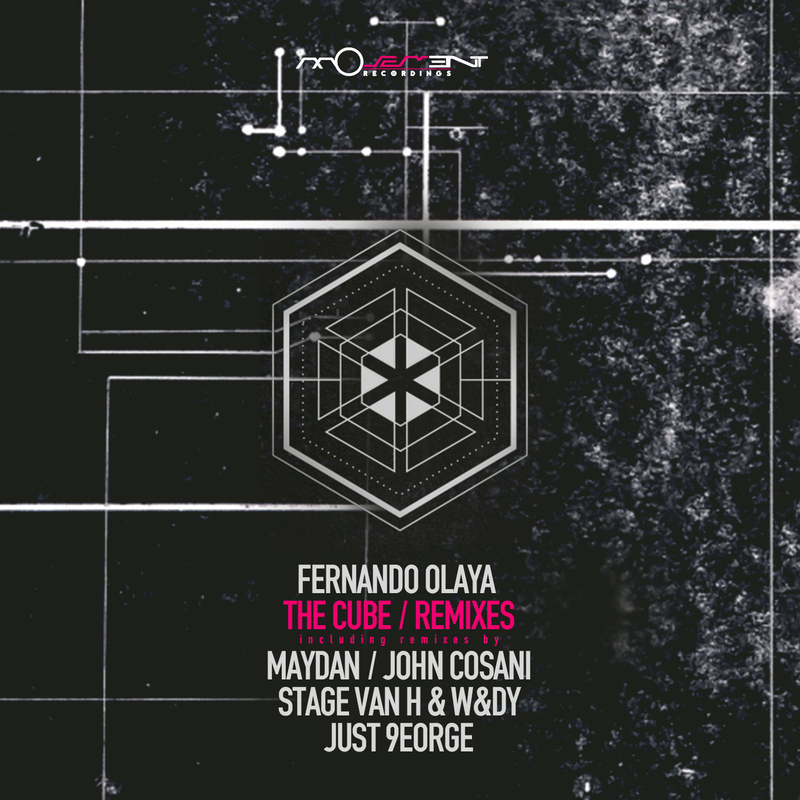 The latest release on Tash’s Movement Recordings finds the label revisiting Fernando Olaya’s ‘The Cube’ EP for a brand new set of remixes. Originally released in July of this year the three track offering proved to be some of the Colombian artists finest work to date. Now four months later we see the Greek imprint calling upon Maydan, John Cosani, Just 9eorge and Stage Van H & W&DY to re-interpret the tracks for the fall season. Leading the release off is Maydan who is making his first appearance on Movement Recordings. The Israeli artist is part of Lonya’s Asymmetric Recordings where he acts as one of the label A&Rs and has also appeared on Hernan Cattaneo’s Sudbeat Music. Here he puts his own unique spin on ‘Ahlam’ taking it into deep techno territory. Backed by a mountainous groove and smooth hypnotic lines the piece builds a mesmerising cadence early. The cross cultural motifs translate wonderfully over the beefy foundation eventually leading to a spiritual break. Following a charming moment the meditative pulse quickly returns as the vocal storyboard continues to evolve through an exhilarating conclusion. The EPs second selection finds Just 9eorge returning for his seventh appearance following a contribution to the label’s Technical Progress Vol. 6 collection from June of this year. The Greek artist has become loved for his soulful productions and he’s worked more of his magic on ‘Sagitarius’. Taking a rugged approach Just 9eorge lays down an acidic groove which proves to be the perfect foundation for the original’s enlightening themes. Solemn and reflective, the piece flows through a storyboard of emotions before the main break seals it’s emotive core with melancholic tones and blissful pads. Gorgeous interpretation from Just 9eorge. John Cosani is up next and makes his second appearance on Movement Recordings following a contribution to the labels ‘Re:Born’ collection from June of 2015. The Argentinean artist has also found a home on Lonya’s Asymmetric Recordings where his modern take on progressive music has flourished. Here he takes the EP’s title track ‘The Cube’ into deeper hypnotic territory which complements the original wonderfully. John’s chunky foundation emanates a strong dance floor sensibility before rough stabs and twisted effects further tantalise the senses. Following a dramatic break fuelled with sweeping noise and sizzling builds, the vocal-like refrains and hazy melodies find a place in harmonic heaven, carrying the piece to an emotive conclusion. The release concludes with two of the labels core artists Stage Van H & W&DY collaborating once again. The Dutch duo have worked together several times in the past with magical results and their interpretation of ‘The Cube’ is no different. With a more techno inspired take than John, Stage and W&DY deliver a great complement with tough kicks and a chugging groove sitting at the foundation. As waves of percussion get worked in the rhythms roll before a big melodic theme initiates the main break. Unconventional chord changes makes for a stunning interlude full of emotion and wonder, before the tough groove returns and the peak time sensibilities take you home. A huge remix from Stage & W&DY which rounds out a superb remix collection from Tash’s Movement Recordings. Don’t miss it.